Members of a generation that grew up with no memories of the Soviet Union may complain about the state, but they don’t expect anything from it, which allows them, maybe, to be happier about their lives. Vladimir Frolov stands near a modern apartment block in the city of Tomsk. Vladimir, 28 and his wife Nastya, 22, are both natives of the city, which has a population of around 500,000 and is located in the center of Siberia, 1,800 miles east of Moscow. A new job in another city could give Vladimir an opportunity to earn more money. With his talents, he would have excellent prospects in the Leningrad Region, which is attracting a lot of foreign investment. But due to his loan, Vladimir is bound to Tomsk. Such barriers, as well as administrative ones, prevent the efficient distribution of the work force. In Russia, only six out of 1,000 people move to a new city each year. In the United States, that figure is four times as high. 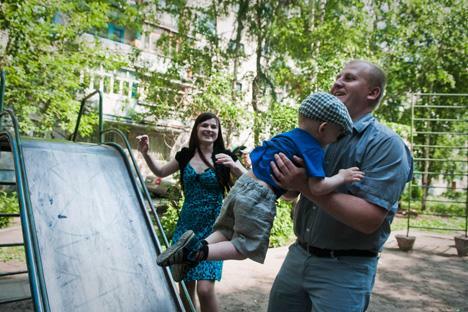 A lack of mobility forces many Russian families into poverty. Vladimir attended Tomsk Polytechnical University and after graduating, began working for Tomsk Electromechanical Plant. He met Nastya there when she asked for his help with a technical drawing. They have a young son, Sergei. Vladimir’s starting salary was 10,000 rubles a month ― roughly $400 – which was not much, even for Tomsk. But in addition to the salary, the company offered the promising, young engineer a company loan with no interest for 25 years, which he used to purchase a one-bedroom apartment in a modern building on the river. The only catch was that if Vladimir is fired or quits, his interest would be due immediately, which is typically in the double digits in Russia. Vladimir is literally bound to the company for 25 years, and his family’s future seems predetermined. Every month, after paying the mortgage, the Frolovs have roughly $670 to spend. Vladimir is the sole earner, because Nastya has started classes for a second degree and also takes care of Sergei. Food costs are somewhere around $200 a month. “Everything else has to be split between child, clothes, culture and everything else,” Vladimir said. He does not sound overly confident when it comes to his future. The Tomsk Electromechanical Plant makes, among other things, giant turbines that siphon smoke from subways. Six of these turbines are currently in use in the Moscow Metro. Many Russian companies are fighting the same problems: a vicious circle of high tax rates and interest, protectionism and corruption. Due to high interest rates, it isn’t feasible for Vladimir’s company to modernize everything at once. However, without proper equipment, productivity suffers, major clients take their business elsewhere and the chance of larger lines of credit at advantageous interest rates falls. Additionally, wage increases, increasing energy costs, intensified environmental regulations and, last but not least, higher government spending fuels inflation. Each increase to the salaries and pensions of officials causes the Frolov’s household budget to shrink a little. If there were more competition on the domestic market, that would affect price trends positively and suppress inflation. But it’s not happening because so many companies have out-dated production facilities. Vladimir is concerned about improving the situation at the plant and wants to help it produce innovative, Russian products. This is one of his goals for the future, and if the plant is successful, it will help Vladimir achieve his other dream: A house on the outskirts of town where he and Nastya can raise three kids. The only problem for this typical Russian citizen is that he has no dream. To put it more accurately, his dream of an apartment has already come true. The framework, within which he no resides, is not conducive to fantasies or dreams, otherwise he would surely find his daily life intolerable. And he still has 22 years to go, before he has paid off his loan. Nastya, for her part, is a little less ambitious – she would be happy with just two kids. Her goals for the moment are more pragmatic. She wants her son Sergei to go to preschool. In Russia, preschool, like regular school, is provided by the state, but the preschools are overcrowded and not everyone gets a place. The government is involved in an ongoing campaign to raise the birthrate, but there is no infrastructure to support more children. Many preschool buildings from the Soviet era have been leased as office space, and strict regulations for registering childcare facilities prevent the creation of private preschools. When Sergei is finally in preschool, Nastya would like to get a job in the social services sector. She would like to earn 20,000 rubles ($650) a month, but would settle for 15,000 ($490). Nastya dreams of a vacation in Sevastopol, where she has relatives. In the future, she would like to travel more – to Egypt to see the pyramids, to Thailand or to Germany, because Vladimir has said lots of nice things about it. As a salaried mid-management employee, Vladimir commutes between the office and the plant. He sees many sides of the business – one of his main responsibilities is processing orders. He also goes on business trips to clients and suppliers. Sometimes he even works in the plant. In one part of the plant, the old equipment has been replaced with new German-made facilities, but replacing all the old equipment is impossible; the company does not produce enough. The biggest challenged to its survival is the lack of long-term contracts. The factory keeps its head above water via short-term projects, making the majority of its money from air purification and automated control systems for oil pipelines. According to Vladimir, the plant would solve most of its problems if two or three long-term contracts could be signed with oil companies or Moscow Metro. “German workers have so much indisputable rights and resources: pensions, health insurance, a house, a car, fitness studios, swimming pools. Our future, on the other hand, is full of uncertainty,” Vladimir says.